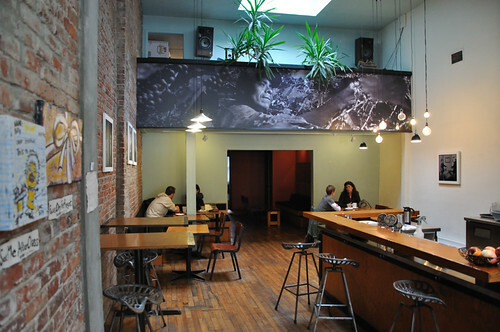 Habit Coffee, originally uploaded by andai. I did head on up to the place, and sure enough the shop was closed. I actually walked right by the shop because I was looking for some prominent signage. Almost reaching the end of that block and wondering if the two women had misdirected me, I stopped and asked a couple that was taking a smoke break if Habit really was on this street. They pointed it out to me… there it was, right across the street with a recessed entrance that had a really small, very nondescript wooden 2×4 plank for signage. I resolved to come back the next day before I had to catch the ferry back to Seattle later that afternoon. So come Sunday late afternoon I found myself doing a mad dash to Habit and this time around, the place was open, thank goodness. There even was a small crowd of folks hanging outside the shop, drinking, smoking etc. I was a little sweaty from the fast paced walking I had done. I didn’t have too much time to fanny about and I had only about 15 minutes to spare before I was to catch the clipper back to Seattle… so I had to get down to business, chat with the barista to at the very least get the basics about them and their coffee. The baristas were great. Even more so because they didn’t mind chatting and me taking pictures within the store. I also must say that everything others had told me about Habit was correct i.e. Habit Coffee serves great espresso. Their espresso blend was a fun, medium blend with great flavor. I liked the fact that they served me a nice strong latte and maybe that was because I ordered the double shot 8 oz latte and not the 12 oz which is my usual standard size. As we were chatting, I told them about the good things I had heard about their coffee and how I came up the day before but they were already closed. I also told asked them why it seemed that just about all the coffee shops in Victoria closed by 5 or 6. The barista told me that Habit was actually going to start staying open late… because there are those who still want their espresso after 6. I think this is great because eventually it will cause the other coffee shops to start opening up later… and that will be good for Victoria’s coffee culture. However, now as I am writing this article, I wonder if the only reason they were going to start staying open late is due to summer and the longer summer days? Maybe if you are reading this post and you live in Victoria, you can keep up updated? I must say that Habit Coffee was probably my favorite spot of all the coffee shop I had tried in Victoria… in terms of the coffee. Artigiano came in a real close second. But I must say that in general, most of the baristas at the various coffee shops in Victoria were all really nice and friendly. This seems to be a Victorian trait though. Seattle is friendly, Victoria is genuinely friendlier and as the coffee culture continues to develop I think places like Habit Coffee are going to be in the forefront of a great thing in Victoria and I also love what they are doing to help develop the coffee culture in Kenya. Morning…, originally uploaded by andai. 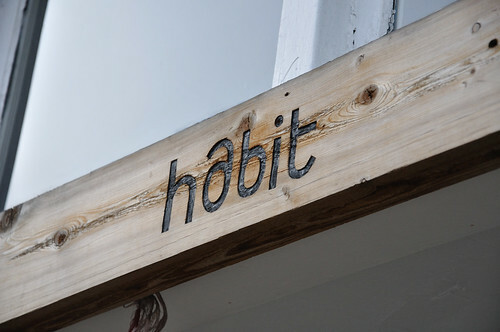 Habit, originally uploaded by andai. Even before I went to Victoria this last time, I kept hearing good things about Habit Coffee. One of the readers commented on a previous Victoria BC blog post I had written and he included a list of coffeehouses that I should have visited. For some reason, Habit Coffee kind of stood out to me and that is one that I made a mental note that I would check it out next time. Well this time around, I hadn’t properly done my homework beforehand and apparently my memory is not that great because I totally forgot the names of the places to visit, including Habit. I just couldn’t for the life of me remember the list of coffeehouses this person had recommended. And since I deliberately left my laptop at home, with no intention on going online, there was no way I was going to go online to retrieve the list. No worries though, Victoria actually has a lot of coffee shops within walking distance of the main harbor and due to the constraints of not having a car, all of the places I was to visit needed to be within reasonable walking distance from the hotel were I stayed. What a minute I thought, Habit, Habit Coffee? That was one of the coffee shops that the guy had recommended. What a coincidence, what luck! Maybe I can check this place after all. I asked them where the place was and if I could walk there. “Sure!” they said, Just head on up Government St to Pandora Ave and turn left. But they also told me that since it was a little late, they place was probably closed…. This I think is so like Victoria, where the coffee shops seem to close really early, early being 5:00 or 6:00 PM. Originally uploaded by, and used with permissions from kennymatic. I discovered Caffé Artigiano a few years ago on one of my first trips to Vancouver BC. At that time I really didn’t know much about the coffee they served other than the fact that I thought the coffee was good. I also really liked the decor of the particular retail location I visited and the reason I went there was simply as matter of convenience due to its close proximity to the hotel where I was staying. Of course if the place even hinted mediocre coffee, I certainly would not have stepped in the door. 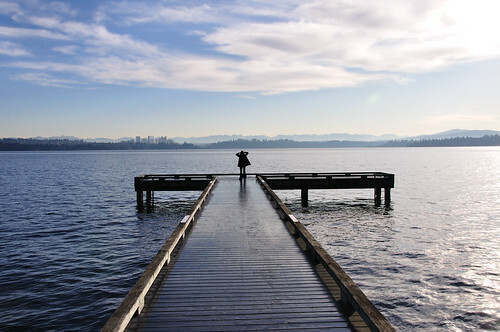 However, since that timer, though I have been to Vancouver again on numerous occasions, I haven’t been back. Not because I didn’t like the coffee or anything like that, but simply because I wanted to take the opportunity to try other coffee shops during my limited stays. So one cafe that I discovered, just a couple of blocks away from the Caffé Artigiano location that I frequented before, was Scuié, the Italian style cafe and espresso place. The other interesting thing that I noticed on my subsequent visits was that Artigiano had multiple locations in the city and that put me off a little, especially since some of the locations did not look as great as the one that I first visited. But what was interesting I found that as I was doing my various write-ups of coffee shops in Vancouver and Victoria BC, more than once, readers suggested that I should go check-out Artigiano for some of the best coffee in Vancouver. Fast forward to a couple of weeks back, this is when I took my second trip to Victoria BC. Due to the fact that to my plan of action was to visit coffee shops that I had not tried the last time, and that these would be coffee shops that were within walking distance from my hotel. I expected that I would include Murchies Tea & Coffee, even though I had been to the place the previous time, but then I found out that a couple of doors down, in the bottom location of the Bedford Regency Hotel on Government Street, there was a small Caffé Artigiano, the same kind of set up as Stumptown at the bottom of the Ace Hotel in Portland. I decided that here was my opportunity to try it out again so that I can this time around do a write-up on the place. I am really glad I tried the coffee there for a couple of reasons. The first reason is simply because the coffee I was served was actually pretty good. I really enjoyed my double short (8 oz) latte. The coffee was nice and strong with great flavor. It was interesting to that they actually do serve short (i.e. 8 oz) lattes because a lot of the coffee shops in Victoria only offer 12 and 16 oz cups. There is one other place in Victoria that I can tell you for sure, Habit Coffee also offers the option of an 8 oz cup as part of its standard coffee menu. The second reason I am glad I went there is because I discovered that Artigiano serves 49th Parallel coffee beans. So what? Well, there is only one coffee shop in Seattle that uses 49th Parallel Coffee Roasters‘ beans and that is Trabant Coffee & Chai down on 2nd Avenue. I’ve been there a few times and the baristas there swear by 49th Parallel as the best coffee beans in the Pacific Northwest which is a pretty bold statement to make in Seattle. Especially considering that 49th Parallel is actually a Canadian based roasting company from Burnaby (Vancouver) BC. What is even more interesting is that the founders and owners of Artigiano are also the founders and owners of 49th Parallel. This brings me to the third reason why I am glad I checked out Artigiano. This past weekend, the World Barista Championship 2009 competition just concluded in Atlanta, GA. The first place winner was Gwilym Davis of London England, but in an extremely close second finish was Sammy Piccolo the founder and owner of 49th Parallel and Artigiano. He holds the distinction of being the only barista to have come in the top 3 spot over the past four competitions, including this year’s competition. He is also considered to be one of, if not the best barista in Canada. So it was great to be able to check out a coffee shop owned by and enjoy the beans roasted by the second place finisher in the WBC 2009. I think the fact that Piccolo is pretty much involved in his coffee business kind of shows in the attitudes of the baristas at the place. I thought the baristas, who took my order, made my drink and chatted about their coffee were great, and very gracious. They gave me a bit of info about the company and the beans, including the blend that they use for espresso, i.e. the Private Reserve Espresso blend. I think it would be interesting if Piccolo decided to open up a shop in Seattle, it would be interesting to see how they would do. I mean, if Kaladi Brothers can do it, then why not? This weekend I just received some really terrible news. I just found out that a close relative of mine was diagnosed with TB. The sad thing about this is that I was not surprised at all. In fact, I am surprised that this did not happen earlier simply because he has been abusing alcohol and drugs for many years and despite interventions from friends and family, has continued to do so. It is amazing how alcohol and drug abuse makes someone, for lack of better words to describe them, utterly stupid. For example, Joe (not his real name) has insisted time and time again has stopped drinking and all that, yet will sneak off to go drink, come back reeking of alcohol and yet claim they haven’t touched the stuff in ages. This is one of the many reasons it’s completely pointless arguing with or even simply pointing out these behaviors to alcoholics and druggies. And to be honest, if this is the only thing he is suffering from, then I will be very thankful. Mirage Signage, originally uploaded by andai. 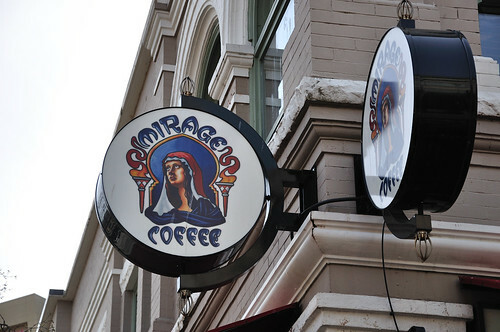 I first walked by Mirage Coffee attracted by their bizarre sign which is of some woman who looks like the stereotypical Virgin Mary images you tend to see. Being that I live on Capital Hill, the home of everything wonderful and bizarre, I have seen my fair share of signage including those that border on anti-Christian sentiment. So naturally the first question that popped into my mind, did the owners have something against Christians? Even though the store was closed for the day the inside was rather dark and rather unappealing and for these reasons the place just did not look like anything worth going to investigate further. Fast forward to the beginning of this month when I was in Victoria for another trip. Some friends of mine, also from Seattle, had been to Victoria the week before and they totally raved about Mirage. And of course me being to some extent sort of open minded guy, decided I was going to put this place on my list of coffee shops to visit. In fact I decided that was were I would go for my Sunday morning breakfast latte… so they’d better have good coffee! So when I stepped into the place that Sunday morning, I was actually pleasantly surprised at how nice the inside looked compared to that I had imagined all these months. The decor was actually pretty comfortable and inviting with the warm, reddish and copper tones. I’ll speak more about the copper tones in a bit. There were a few people in there, a mixture of older and younger crowds, and some visitors from out of town who apparently had also heard about the place. Now the copper tones I mentioned earlier were the two huge vintage style Elektra espresso machines they have sitting on the counter. These machines are really beautiful copper and brass machines that are styled to look like they are at least 60 years old! Elektra Machines at Mirage Coffee, originally uploaded by andai. So when I saw these machines, the first thought that came to my mind was Vivace! That is, Espresso Vivace up in the Capital Hill area. 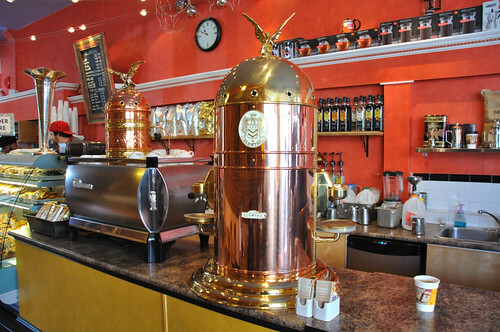 The original Vivace store location and roasting ‘plant’, which was torn down last year also had similar copper vintage style espresso machines on display. I don’t know what make/brand those were, but so seeing these ones at Mirage immediately made me think of the one at Vivace. And yes I know, Vivace’s actual original location was the espresso stand that’s still on Broadway. I talked to the barista about these two machines and yes they do on occasion pull espresso shots from the larger machine. I tried to look up information about the machines and what I can tell you is that the larger machine is a part of the Belle Epoque range of espresso machines from Elektra. The other, smaller one is also an Elektra but I don’t know what make/model it is. This smaller one sits on top of the La Marzocco, which is their main espresso machine and is primarily for display purposes. Oh! how I would have loved to see the machines at work… well maybe next time I’m in town. And what about the coffee? I actually though the coffee was pretty decent. Nice, strong and bold… I enjoyed it… so at least I didn’t feel like my Sunday morning latte was a waste. Their espresso blend does not have a specific name, but simply, Espresso Blend. I talked to Percy the owner and he told me that Mirage does roast their own beans. I however, do not know who the master roaster is. It first I assumed that it could have been Percy, but later when I when to their website, they did not give much specifics… and I didn’t realize this but they do have a number of other locations, a least four at the time of this writing. I suspect that these might be franchises. I visited the one on Government Street. Empress Tea Cup, originally uploaded by andai. One of the things that I really wanted to do the first time I visited Victoria BC was to do the old afternoon tea… something you really don’t see in Seattle, the land of all things coffee. At that time, we had considered going to the Fairmont Empress Hotel in Victoria in part because they are world famous for their for their afternoon tea tradition. We heard that the afternoon tea there was rather expensive and so we decided that we would to the White Heather Tea Room and have our afternoon tea there instead. 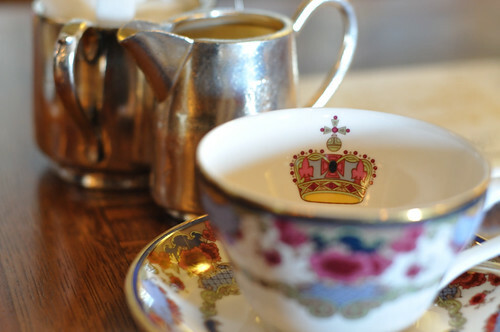 The tea and eats at White Heather Tea Room were great, but on publishing this post about places in Victoria to experience afternoon tea, One of the commentators, Beth, highly recommend that we try the afternoon tea at the Empress. Yes she admitted that it was rather expensive, but it was also one of those things that you should do at least once. And she was not the only one who gave us the same suggestion. So this time around, finding ourselves in Victoria once again, we decided that we would bite the bullet and actually try out probably the most famous afternoon tea tradition in Canada. The first thing we did was to make reservations to ensure that I would be able to get seating. During the high tourist season, the place is pretty popular and you may need to make your reservations early, as in days earlier, but in our case we called in the morning and were able to make reservations for the afternoon. I suspect that had we simply walked in without any reservations and asked for seating, we would have gotten in. Late March/early April is certainly not the tourist season, and with the not so great economy, it was pretty easy for us to get in. 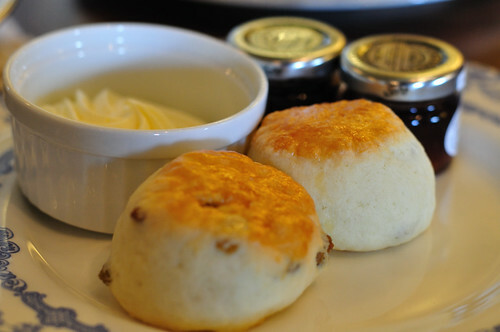 Scones, Cream and Preserves, originally uploaded by andai. I was really excited to try out their tea. The Empress actually uses their own custom blended tea which includes one of my favorite teas, Kenyan tea. The only thing I didn’t like was the fact that they milk they bring (for those of you who like milk with their tea) does not come heated. I prefer adding warm milk to my black tea instead of adding cold milk. The first thing they brought out was a fresh fruit salad served in glass/crystal goblets. The fruit was great…. and once we were done, they then brought out the three-tier serving trays with the three S’s, the savories, the scones and the sweets. I loved some of the sandwiches though I was able to confirm once again that truffles can get a little too strong for me. I loved the cake type of sweets. The chocolates were decent but I am not necessarily one who goes too crazy about sweets. But what I really liked were the scones. The scones are pretty awesome and they come with a small jar of fresh preserves and fresh Devonshire cream, which is rather rich and extremely delicious. These are not those scones you get in your ordinary everyday coffee shops here in Seattle, that’s for sure. Like I said before, the tea was great! They serve a blend of teas that include, Assam, Ceylon, South Indian, Kenya and China teas. This blend, known simply as the Empress Blend, is made specially for the Empress by the Metropolitan Tea Company. It was a pleasant surprise to discover at the end of our tea, we each got a box of this tea to take home with us. I am enjoying that tea on special occasions where I just want to relax in the evening and a nice homemade cup of tea. What all was said and done, we paid $44 each for our afternoon tea. This did not include tax nor any tips. Like I said before, it was pretty expensive, but it was also a once in a life time splurge. Certainly for many of us, not something that you’d want to do very weekend but at least you can say that you once participated in that time honored Victorian (BC) tradition of the afternoon tea at the Empress Hotel. Umbia at Macchiato, originally uploaded by andai. Macchiato Caffé or simply Macchiato, is located on the corner of Broughton St and Broad St (entrance) was the first official stop on my second coffee excursion in Victoria BC. I actually passed by Macchiato several times during my first trip to Victoria. I did not however go in there for a couple of reasons. On first occasion I had just had lunch at lunch at Konpira and being pretty stuffed, I wasn’t in the mood for coffee. Konpira, by the way, which is only half a block away, is my favorite Japanese restaurant in Victoria. They are famous for their limited hand-made Udon noodles and extremely fresh sushi. The Japanese master who owns the restaurant makes only about 30 or 40 servings of the hand-made Udon noodles and so if you don’t get there early, you are out of luck. But I digress… back to coffee. On a couple other occasions I passed by the place, they were already closed for the day… pretty early actually. So I decided that I would have to save the pleasure of checking out their espresso for my next visit to Victoria. And I am glad I did because when I wrote my series of posts on my first visit, I couple of folks suggested that I should try the place since they had great coffee. On stepping into the place, the first thing I noticed was the modern look and feel to the interior design with plenty of metal and lighting. This was a modern Italian style of décor but somewhat reminding me of places like the Victrola Coffee on Pine St in Capital Hill or the Top Pot Doughnuts on 5th Avenue, downtown Seattle. Now I know some love that kind of décor, but I tend to like places like the original Top Pot Doughnuts on Summit Ave in Capital Hill or the original Fuel Coffee on 19th also on Capital Hill. The other thing I noticed was that everyone seemed to know everyone else… and to some extent that seems like a very Victoria BC trait. I actually loved the vibe and sense of community the place had. The baristas (including the owner who actually pulled the shots) were nice and friendly. There was a bit of a miss communication issue with one of baristas but that was more of a Seattle coffee terminology vs. Victorian (Canadian) coffee terminology… but everything worked out great. The coffee was actually pretty good. 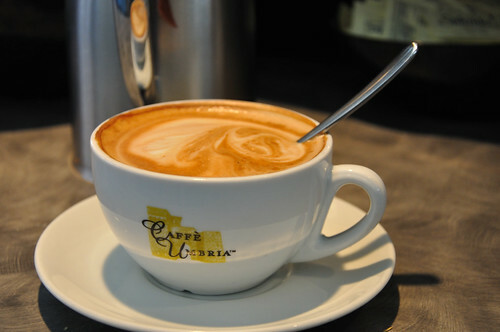 They served my favorite Caffé Umbria espresso blend, the ‘Gusto Crema’ blend, a great medium roast blend. The only downside was that they didn’t have whole milk, but I guess I could live with that. I would say that I certainly would go back again for coffee. And I would certainly try out some of the sandwiches for which I guess they are pretty well known for… that is if I don’t go to Konpira first for udon noodles. 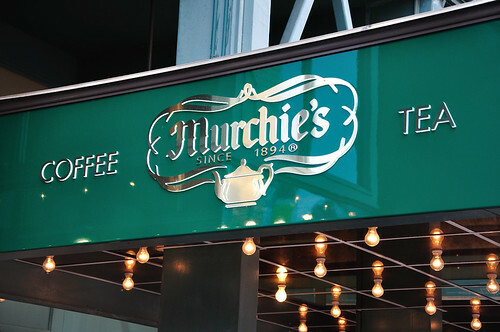 Murchies, originally uploaded by andai. A couple of weeks ago, I took a weekend trip to Victoria BC so that I could once again sample Victoria’s growing coffee scene. This is the second trip that I have taken to Victoria over the last 12 months. The last time I visited, I was there for a couple days before heading up to Vancouver and at that time I was able to visit a number of Victorian coffee shops including the following; Serious Coffee, Sounds Like Coffee, Dolce Vita Coffee Art, Murchies Tea and Coffee, and White Heather Tea Room – for afternoon tea. I also checked out Salt Spring Coffee while I was on the way to Victoria. I can tell you that with all that caffeine in my bloodstream, I was super alert the whole time I was there.. and as hard as it might be to believe, I may have actually drunk a tad too much espresso for the short time that I was there. So this time around I needed a slightly different approach. I was only going to be there from Saturday late in the morning, leaving the next day in the afternoon meaning I had a really small window of opportunity in which to sample as much as I could without getting over caffeinated. So the game plan was instead of ordering 12 oz lattes all the time, I would in some cases just order the 8 oz lattes… still maintaining the double espresso shots though. At the very least, it would not be as filling so I should be able to sample more places. The other limitation I was facing was that since I wasn’t driving, all the places I was to try out would have to be within reasonable walking distance. I didn’t think this would be a problem at all since Victoria, relative to its size, actually does have a lot of coffee shops, all within easy walking distance from the downtown harbor area. 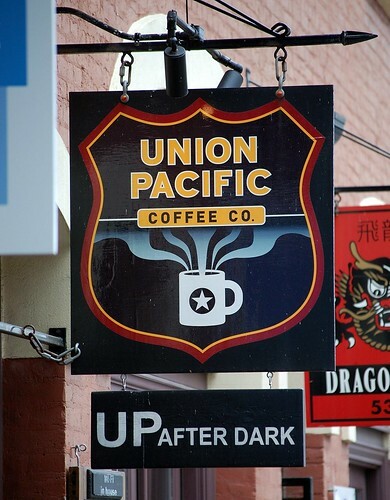 Union Pacific Coffee Company Sign, originally uploaded by andai. I didn’t have a list of actual coffee shops that I wanted to visit, but there were a couple that I had in mind including Mirage Coffee, Union Pacific and Grindstone Cafe. Someone had also suggested that I should check out Caffe Artigiano, which I had done the first time I ever visited Vancouver and Macchiato. I was not able to sample anything at Grindstone, nor Union Pacific because they were closed, but I was able to visit; Macchiato, Mirage Coffee, Caffe Artigiano, Habit Coffee and also The Empress Hotel, for Afternoon tea. So what do I think about Victoria’s coffee scene? I think in general, they are doing relatively great. I think the scene is growing little by little and there is certainly excellent coffee to be had. I would say that my top three coffee shops were Habit Coffee, Caffe Artigiano and Mirage Coffee, and this includes comparing with my previous trip to Victoria. The one thing that I think is still lacking is the late night coffee scene, hence the title of this blog “… Not Quite Up After Dark” which is a play on words regarding Union Pacific, a coffee house that closes by five, and reopens as a tasting restaurant (modeled after Salt) called ‘Up After Dark’. This was my main takeaway about coffee in Victoria is that most of the coffee shops seem to close relatively early, anywhere between 5:00 and 6:00 PM… 7:00 is certainly pushing it. I actually complained about this to the folks of Habit Coffee and they told me what they were actually thinking of staying open much later. I think that would certainly help grow the coffee culture in Victoria.